From Sunrise To Well After Dark, The Street Is At Your Service For A Fantastic Meal Over Great Conversation. There Isn't A Bad Table In The House. Sitting on the same side of the booth at Domo Sushi makes it easier to clink her glass of sake with his Japanese beer. But the real party is the colorful masterpiece of sushi, sashimi, and sauces on the table. Elbe wears a Layla dress, Elizabeth & Prince El Paseo; Pam Lazzarotto Designs bracelet and Marcia Moran earrings, BB.one. Chris wears a Mr Turk shirt and Eleventy shorts, Saks Fifth Avenue Palm Desert. Dining with your furry bestie on Palm Desert's outdoor shopping esplanade offers year-round bliss. Pet-owner picks for restaurants that welcome well-behaved pooches to their outdoor seating areas include AC3 Restaurant + Bar, Café des Beaux-Arts, The Coffee Bean & Tea Leaf, Daily Grill, Fix, a Dessert House, Il Sogno, JC's Patio Café, Starbucks Coffee, The Venue Sushi Bar & Sake Lounge, and Wilma & Frieda. When you have young ones in tow, you likely have at least one picky eater on your hands. Until their palettes are more developed (and willing to try something beyond a chicken strip), these El Paseo restaurants are happy to cater to even the fussiest little creatures of habit. 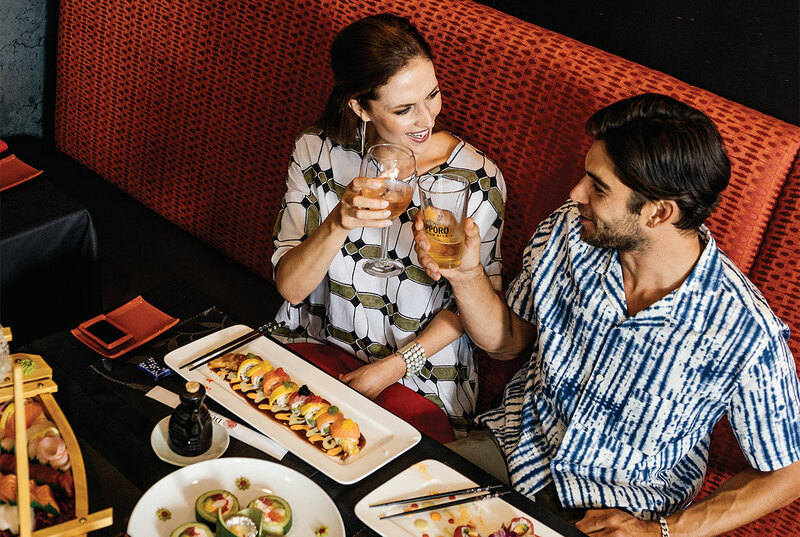 Everyone can agree on a meal at California Pizza Kitchen, Daily Grill, Pacifica Seafood Restaurant, Piero's PizzaVino, Sammy's Woodfired Pizza & Grill, and Tommy Bahama Restaurant & Bar. Patios for people-watching line the boulevard. One of humanity's oldest pastimes is an elevated art form here, where California's relaxed resort lifestyle meets shoppers vacationing from around the world. One level up, balcony dining at Pacifica and Tommy Bahama affords front-row views of the mountains by day and city lights by night. So, what will it be? Locals have their favorite restaurants and dishes along El Paseo. But those who choose to can have a long, hot streak of never eating the same meal twice. Variety is on par with quality, ambiance, and highly memorable experiences — whether for a party of two or a milestone celebration among friends and family.